With a 50-pack spindle of Verbatim 25GB BD-R LTH Blu-ray 4x Discs, you can conveniently backup large data files and burn HD video to Blu-ray media. With 25GB of storage space, your backups can use less discs when compared to other media, such as blank DVDs. Verbatim's Low-to-High (LTH) manufacturing process is designed to be more cost-effective and efficient, while delivering a BD-R disc with the same data storage capabilities of standard BD-R discs. These write-once BD-R LTH discs are compatible with many drives from companies such as Sony, Pioneer, Panasonic, and LG. However, not all burners and players support BD-R LTH discs, so please confirm the compatibility of your equipment. 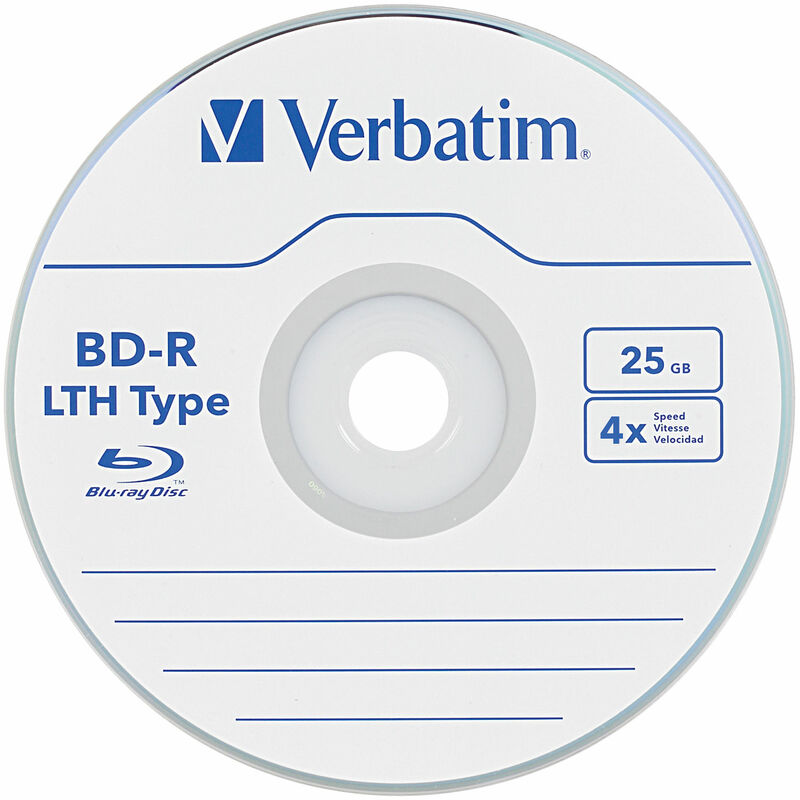 To help ensure the longevity of your burned BD-R LTH discs, Verbatim has treated each disc with a protective hard coat. This hard coat is meant to help make them more fingerprint-, scratch-, and dust-resistant. Box Dimensions (LxWxH) 5.0 x 5.0 x 4.0"
25GB BD-R LTH Blu-ray 4x Discs (50-Pack Spindle) is rated 4.7 out of 5 by 3. Rated 4 out of 5 by Matthew E. from "LTH" vs "HTL" blu-rays - Understand What You Are Getting These are LTH ("low to high") blu-rays, while "normal" blu-rays are HTL ("high to low"). The difference is in the material. Normal blu-rays have a dark black surface that becomes lighter after it burns. These LTH blu-rays have a light gold surface (looks more like a CD) that becomes darker after it burns. So the burning method is basically opposite. You can easily see the difference in material with your naked eyes. Of course, video quality is the same because you still get the same data either way. So why does this matter? It doesn't, except that some very old blu-ray players may not play LTH blu-rays like these. Most blu-ray burners will burn both normal and LTH discs, but some very old ones may require a firmware update. Finally, studies show that LTH discs decay faster than normal blu-rays, due to cheaper materials. They have a shelf life of several years, versus decades for normal blu-rays. LTH discs are cheaper and are totally fine for most applications. Your average consumer won't know the difference nor will they care. I even use these LTH discs professionally for certain applications. But for a lot of professional use and situations where compatability with every blu-ray player is very important, I do recommend coughing up the extra cash and getting normal blu-rays instead. Normal blu-rays are called "BD-R HTL Type" or, more commonly, just plain old "BD-R". Rated 5 out of 5 by Hunter from Very Dependable Recording Source I no longer search for other brand media as through the years I have come to trust that Verbatim blank discs are dependable. I use around 200 blanks a year for sharing HD video and have been very pleased with this brand. Does any DVD/CD burner work? 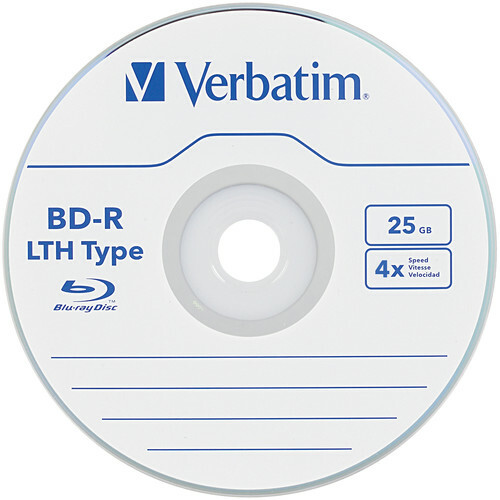 The Verbatim 25GB BD-R LTH Blu-ray 4x Discs (50-Pack Spindle) B&amp;H # VEBDR254X50P is Blu ray media so you need a Blu ray media capable burner. A standard CD/DVD burner would not work. Is the product compatible with an EZ DigiMagic disc burner (Model DM550-P20)? The DM550-P20 does not support blu ray media so it is not compatible with the Verbatim 25GB BD-R LTH Blu-ray 4x Discs (50-Pack Spindle) B&amp;H # VEBDR254X50P.